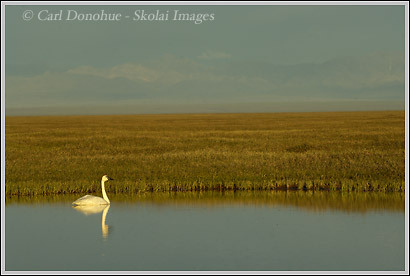 Another Tundra Swan, Arctic National Wildlife Refuge, Alaska. I wanted to follow my previous post with this photo, showing the environment and landbase the tundra swan lives within.This is the same bird, in the same pond, from almost the exact same spot – but this photo was taken with a wider lens (Nikon 70-200mm). I love tight, close-up portraits of wildlife (and people) but I always enjoy a photo showing the subject in place. I think of ‘in place’ as reference to the greater scope of what we mean by ‘nature’. When we closely consider the world around us, we begin to see that these creatures and features we share this existence with do not live in isolation, and aren’t, in fact, separate from one another. Rather, they’re as intrinsically intertwined as my finger is with the rest of my body. I think the distinctions we see, the boundaries we experience as definite, are very permeable, and not really boundaries at all. We think of our hand as separate from our foot, because our brain likes to perceive things that way .. this is largely the way we’ve come to see the world. But the reality is there is no definite ‘boundary’ between the 2. Similarly, we see rivers and mountains and trees and plains and tundra and rocks and sand as separate things. The reality is that those features are not separate from one another. In fact, they can’t exist separately from one another – they are absolutely a part of one another. Even on a physical level, these “things”, when broken to the molecular level, can be seen to be completely inter-connected to one another – we’re even all made of exactly the same ‘stuff’. Extend this to lifeforms, such as the caribou, the wolves, the foxes, the grasses, the birds, even the tundra swans .. yes, even ourselves, and we see the landbase is everything – everything around us, including ourselves, exists within a greater realm, in a greater context. This tundra swan is as much a part of the tundra as the rolling hills, the lichens and the grasses, the mountains and the sky above. This is what makes it what it actually is. I wanted to show the swan here as a part of that greater realm, as a subject within the landbase, the coastal plain. All of the characters who live on the coastal plain are critically important to its makeup, not just the vast caribou herds, but the ‘little guys’ too – the foxes, the lemmings, the arctic hares, the tundra swans, the hawks and falcons, even those pesky mosquitoes. Even, dare I say it, that sneaky snowy owl I mentioned earlier that wouldn’t let me take his picture. This entry was posted in Adventures, Alaska, ANWR, Backpacking and Hiking, Birds, Environmental Issues, Landscapes, Wildlife on May 28, 2007 by Carl D.